Fleetwood Town boss John Sheridan has warned that the club is not safe from the drop following his first defeat. Town were beaten 3-2 at Rotherham United on Saturday, leaving them on 51 points ahead of tomorrow’s trip to Oxford United. They are 13th in the League One table, nine points clear of Rochdale who occupy the final relegation berth and still have two games in hand. Sheridan said: “I don’t think 51 points will be enough so we have got to be aware that we still need points. “In my eyes we need another win or two points just to give me a bit more security and belief that we will stay in the division. Town had been unbeaten in seven before the Millers defeat. With that in mind, as well as five clean sheets in a row, Sheridan refused to be too hard on his players – but admitted it was their worst display since he took over in February. He said: “It is the first defeat since I have been here. “I think we could have got a draw out of the game but I don’t think we played well. “We got off to a great start but I think Rotherham were the better team without creating too much against us in the first half; they had a lot of possession. “I just thought we looked a bit flat. Again, I’d like us to have a bit more belief. “We got off to a great start and this is probably the best pitch in the division. “With the system we played we should have been passing the ball and trying to create problems for them a little bit more than we did. “We did not really play on the front foot and we just did not get going. “I know we scored two goals and it was 3-2 but we just did not get going. “Recently we have created a lot more chances than this. “Going forward it is probably the worst we have played since I’ve been here; over the 90 minutes I don’t think we really got going. At the other end, Town had only conceded two goals since Sheridan’s arrival but their former Achilles heel of crosses and set pieces haunted them again. Nathan Pond diverted a cross into his own net, Joe Newell scored from Town’s failure to clear a corner before ex-Fleetwood man Richard Wood popped up from close range to bundle home a free-kick. 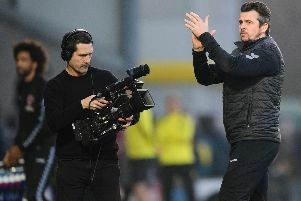 Sheridan, who had seen his players score twice from thier own set-pieces through Ashley Eastham and Cian Bolger, said Town know they can do better. He said: “Defensively, we have been solid as a rock. “I will analyse and look at it; I think I know who could do better and what we should have done better. “I felt we gave a lot of silly free-kicks away; Newell has got a good delivery and unnecessary free-kicks just put you under pressure. “The third goal is a prime example. “We are on the edge of their box trying to pass a ball, we misplace a pass and give away a free-kick in a dangerous area.